What options do you have for storefront protection? 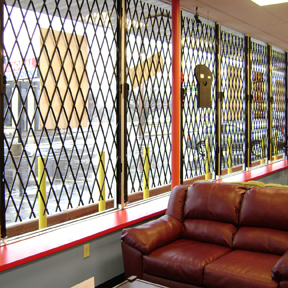 Quantum Security’s tubular steel lattice is a highly effective and competitive storefront entry solution. Because large openings can be secured at an attractive cost, many of our corporate clients tend to favour the security gate lattice system over roll down shutters and aluminum folding grilles. This product’s unique hinging feature allows gates that are hinged to one another to be neatly folded away after traversing the top track on bearing rollers. Our heavy-duty, Double Lattice Burglar Bar Doors and L206 Locking Post with thumbturn, provides formidable protection for front doors, emergency and man-door exit. What locking systems go with the door gates? The L206 lock post with mortise cylinder and thumbturn is used to join the burglar bar doors in the centre. At any time, your locksmith can change the cores to be keyed-alike to your front door system for convenience and ease of use. What other features does this system have? What types of retail fronts most commonly use Quantum gates? If you agree Quantum security gates are the right choice for you, please contact us today and we’ll have them delivered and installed in no time. Had a break-in or security breach? Find the right gate for you. For a free, no obligation consultation on your security needs, contact Quantum today!